1. RSS and BJP and some elements in Congress ( like OP Soni MLA & Raj Kumar) are inimical to the development and very recently RSS opposed widening of a small part of road i.e. 150 meters long where the affected landowners had even received the compensation after they had last even in Supreme Court. 2. This was enough for Badal clan to clandestinely divert funds to Malwa region which rightfully belonged to Amritsar. 3. BJP was some how planning to shift him to some other constituency which was to his liking. Also the new regime in BJP had grossly ignored him. BJP even promoted some people who had not supported him during election due to communal reasons. 4. That Sidhu had remained absent from his constituency for a long time busy in shooting TV serials in Bombay and while he was away there were posters making political fun of his continued absence. Under these compelling circumstances he virtually rebelled and exposed many a skeletons in the SAD/BJP cupboard. An astute politician he blamed SAD sparing his own BJP and finally proved that it is the BJP which wants him and not that it is Sidhu who needs BJP. He thus becomes the first politician to assert after many years of murky politics of East Punjab and thus proved his mettle and emerges among the top politicians of Punjab after P.S.Badal and Captain Amrinder Singh. Here we append the story that appeared in Times of India about giving up his proposed faste unto death because his demands have been met. AMRITSAR: BJP MP from Amritsar Navjot Singh Sidhu on Saturday called off his proposed fast-unto-death after receiving a written assurance from Punjab chief minister Parkash Singh Badal that developmental work would be carried out in the holy city of Amritsar in a time-bound manner. Sidhu had received Badal's letter on Friday late evening but he chose to call off the scheduled fast on Saturday morning even though there was no preparation made for the hunger stir till late Friday night at Hall Gate, venue for the protest. Ironically, the promise made by the CM was identical to an announcement made by deputy chief minister Sukhbir Badal at a press conference here on September 10, wherein he listed developmental work plans for the city and the time needed for the implementation of projects. "I am not happy but I am satisfied, I welcome it," this is how Sidhu reacted while showing the copy of Badal's letter to the media on Saturday. Significantly, no prominent BJP leader from Amritsar was present during Sidhu's media interaction. Sidhu, who remained composed and kept on expressing gratitude towards Badal during the entire meet, regretted that despite being the voice of 15 lakh people of his constituency, the state government forced him to announce the extreme step following which a meeting was held and the letter sent to him. He said still a lot more was needed to be done. "The biggest room in this world is the room for improvement," he said. Justifying his decision, the cricketer-turned-politician said he didn't have any personal issue or ego but he wanted to fight for the development of Amritsar. "Amritsar first is the aim and motive of my life," he said. "I regret to say that whatever issue I raise is tagged as Sidhu's issue and left behind. This is wrong, I have no personal issues," he said. Sidhu reiterated his demand for giving special status to Amritsar and urged the government to convene a special session of Punjab assembly to pass a resolution clearing special funds to the city. He said he wanted to see who would oppose the resolution and if there was no opposition then development of Amritsar should get a boost. Sulking about not being consulted on projects for Amritsar, Sidhu said, "There should be involvement of elected representatives as they are the mandate of people. It is murder of democracy if an MP is not invited or involved in the decision making process of his/her constituency". He said he would also hold a meeting with Badal to discuss a few projects. The former Test player also expressed satisfaction that the government had informed him that part of the funds transferred out of Amritsar had been restored. "Bahut der kar di meharban aatay aatay, par darust ayae (It has taken a long time to come, but better late than never)," he said when asked about the delay in conceding his demands by the government. 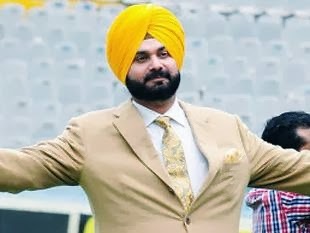 About contesting the coming Lok Sabha elections, Sidhu said he had never sought a party ticket, and it was up to the party to decide.